If you are drawn to Chinoiserie, you have probably thought of it in rooms like a foyer, powder room, dining room, or bedroom. But why not the kitchen? You will notice that in each of these examples, Chinoiserie touches are used in white kitchens to really great effect. The first kitchen above looks like a typical apartment kitchen. 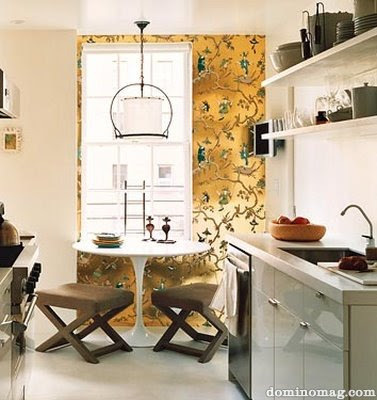 The one wall of gold Chinoiserie paper is a dramatic and unexpected choice and defines a separate eating area. I also love the addition of the Saarinen table and X-benches. 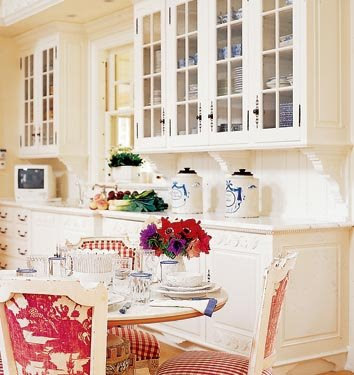 The white kitchen below is transformed by the use of red and white Chinese toile on the chair backs. I love this kitchen. Here again a white kitchen dramatically changed by this vibrant Indian cotton. 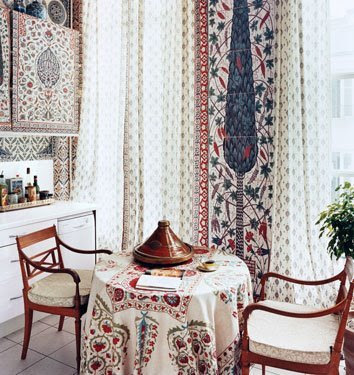 Here is a real lover of Chinoiserie. Note the blue and white Chinese porcelain, the Chinoiserie art by the brilliant artist Anne Harwell, the Chinese Chippendale counter stools with Brunschwig & Fils Chinoiserie toile seats, the pagoda lantern, even a Chinoiserie toile as the computer wallpaper. This is my kitchen in case you haven't guessed. Thank you so much to Anne Harwell for the lovely mention today on Annechovie. No other blogger has been more supportive of me starting my two blogs. I have four of her works of art near my blogging spot as daily inspiration. Gorgeous. I want to do my house over every day I look at this new blog!!! Your taste is so great! That Anne is always so gracious in her support. Wonderful post about you today, you would have lots in common! hmmmm... I THOUGHT that kitchen looked familiar! Love the first pic with the wallpaper. You realize you are basically planning my dream home, right? After I amass my fortune, I'll just send the architect to read this blog. g.-Thanks-you are so sweet. It's amazing how many of my pictures come from Domino Magazine-it still continues to inspire-so sad it's gone. A Gift Wrapped Life-Anne is a truly wonderful person. I wish all of us lived in one town-how great would that be? I started a DC Design Bloggers group and we have monthly get-togethers. It is so fun! I really like the mix of modern furniture with the Chinoiserie wallpaper in the first kitchen. I was watching Carter Can (terrible show really) on HGTV last night and he used toile wallpaper on the inset of kitchen cabinets. The paper choice was terrible (some classic Chinoiserie paper would've been SO much better), but I rather liked the idea, especially for sprucing up ugly cabinets on a budget. Love you blog! These pics are beautiful. Averill-It's a really great idea. I love it. I am going to look for examples of this. Thanks so much. One could also photocopy and glue it on like my Chinoiserie filing cabinet post. You are a treasure trove of ideas. Why did you and I go to law school and not interior design school? Did you know the brilliant designer Daryl Carter went to Georgetown Law School? I graduated from George Washington Law School. Kwana-Thanks for stopping by. I know you are a follower of Annechovie as I am. I hope you'll come back! I've always loved the first pic from Domino, I love the sleek white cabinets with the chinoiserie! Abby-I think it's a wonderful idea for creating drama and a visually separate eating area in an otherwise fairly standard issue kitchen.